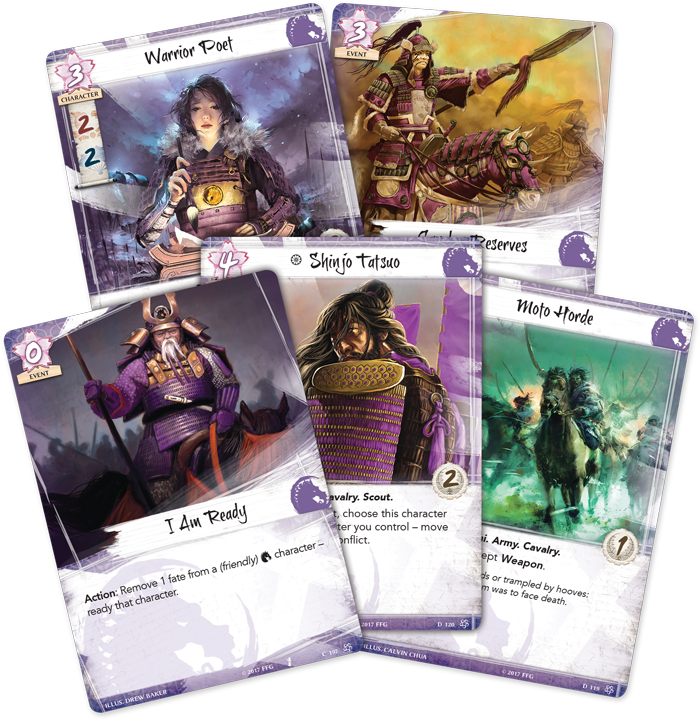 Just a week from now, you'll be able to get your hands on the new Legend of the Five Rings game from Fantasy Flight Games. Well, those of you that are going to be at Gen Con, anyway. Don't worry, though. The rest of us will be able to get it shortly thereafter. In this preview, we get a look at the Unicorn Clan. And no, they have nothing to do with MLP. Though the cards do have a nice shade of purple as a border. Eight-hundred years ago, the Ki-Rin Clan left Rokugan to scout the world for enemies beyond the Emerald Empire. When they returned, they cut a swathe through the Crab Clan’s defense and devastated the Lion. Though they have returned to the fold, reborn as the Unicorn, the Clan still struggles to integrate with the rest of the Emerald Empire. They are viewed as foreigners with strange ways, wandering nomads who fight in unnatural ways with their powerful Meish?d? magic and superior horsemanship skills.